Harrodsburg is rich with history and historical ties dating back to Daniel Boone and some of the first settlers in the area. How neat! The area offers so much to do! Historical venues, museums, Shaker Village, Lake Herrington, Harrodsburg also has a beautiful Main Street area with lots of shops, businesses and restaurants! Visit Harrodsburg/Mercer County for a great experience. Harrodsburg/Mercer County is home to three (3) large and three (3) medium size industrial manufacturing plants. Hitachi Automotive, Corning, Inc. and Wausau Paper are major industries for our community providing over 2500 jobs. KeyTronicEMS, Toyota Boshoku and Kentucky Utilities (Power Plant) provide a combined 500 permanent and over 200 temporary positions. Other industries that are important to this area are Tourism (due to the historical significance of the area) and agriculture, especially beef cattle. The people of Mercer County pride themselves on the historical ties within Harrodsburg, Salvisa, and Burgin. Friendly faces and conversations are abound in the downtown district and also during festivals and gatherings throughout the county! 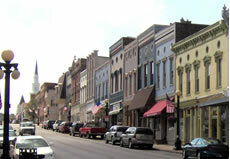 Danville- Boyle County, is a neighboring county to Mercer. Danville houses constitution square which is where the first constitution of Kentucky was signed. Also, there is a historical road called Maple Avenue which is home to many historical homes. Also, in the Danville area is Pioneer Playhouse which produces many outdoor productions during the summer months! Our region is full of history and family fun! Over 30% of those employed in Harrodsburg are employed in the manufacturing industry. The county average in KY is only 11%. Corning, Inc. is the only place in the USA where "Gorilla Glass", the glass on your cell phone, is made. SCA Paper (The Swedish Paper Company) has one of the two largest paper rollers in the world. The continued efforts of the Harrodsburg Mercer County Tourist Commission in marketing Harrodsburg to a national audience has garnered another accolade for our community! Best Choice Reviews, a company that sifts through information to find the best of everything, has selected downtown Harrodsburg as one of “50 Best Small Town Downtowns in America”. Ranked as #41, Harrodsburg is the only Kentucky city to appear on the list! The prominent directory promotes the idea that small town America is alive and well across the entire United States. Numerous small towns have become gathering places for residents and visitors across the country and many downtowns have rich history and culture attached to them. Central business districts typically offers places to shop, unwind, dine, attend festivals, hear music and so much more. This is a great place to work, live and play. In addition to being a great place to work, Harrodsburg provides access to many historic places as well as the arts and entertainment. A small enough community to know you by name with access to big city life.